My new leadership book is now available for purchase. It is a powerful study guide to improving your personal leadership, team leadership and presentation abilities. 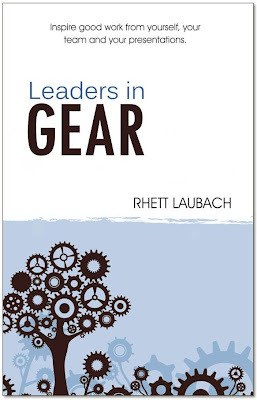 Learn more about this great new resource and order your copy today - http://leadersingear.blogspot.com/. The reason for asking this question is simple: just because the data is inherently dull doesn’t mean the transfer of it from you to the audience has to be. All one-on-one of one-on-many presentations need to be engaging or the audience is going to lose interest and thus the presentation is a waste of everyone’s time and energy. The goal here isn’t to turn every presentation into a rock concert or three-ring circus. The goal is to be engaging as a presenter so you can earn the attention and trust of the audience. Once you earn their attention and trust, the audience is in a better position to understand, remember and use your information to create their own new ideas, projects, goals and actions. Share your personality with the audience. Even if you have a dry or dull personality, you still need to get your unique stories, background and journey into the presentation. Your task is to connect with them on a personal level because chances are good they won’t naturally connect with your boring information. Of course, if your personality is vibrant and rich, be authentic. Use your humorous or witty commentary to spice up the transfer of the data. Finally, it doesn’t matter whether your personality resembles a monkey or a sloth, you still need to be passionate and enthusiastic about your content. Relay this to them using passionate and enthusiastic body language. Variety is the key: variety in facial features, tone, pace of voice, pace of walk, volume and gestures. Involve the audience. Ask them a question and have them discuss it with a partner. Have everyone stand up after you cover two or three points and do a quick mixer where they find a few people not sitting near them and briefly discuss what has been covered. Do a demonstration involving all or a few of the audience members that reinforces a key piece of data. The key here is to get creative with the transfer of information. Just because you said it, put it on a slide or typed it in a handout does not mean the audience is going to understand, remember or use it. Take out the energy gaps. Energy gaps are the empty chairs between people you see at almost every lecture or event in the world. These steal the energy from the room. Force people (in a nice way) to sit up front, in the middle and next to each other. Rope off the back rows if you have to. Use visually-based slides. It is amazing how poorly PowerPoint, Keynote and other slide show software is still used even with the existence and popularity of great books like Garr Reynolds’ Presentation Zen and Nancy Duarte’s Slide:ology. The basic guideline most boring slide shows are breaking is that slides should be full of images that visually support the message instead of text that is simply re-telling the message. Make the presentation short. If you know your content is inherently dull and you have control over the length of the presentation, make it as short as possible. Chop it down to just the stuff you need to add context or further explanation to in person and email the rest to them. Don't give the presentation. Most boring topic presentations don’t even need to be made. The content is better served as a memo, email, article, blog post, annual report or book. Just because the audience needs the information doesn’t mean they need the information in spoken form.